Raise your hand if walking down the detergent aisle in a grocery store bothers you physically. I would imagine there are a few raised hands! A number of years ago I began to notice that laundry detergents and fabric softeners caused symptoms from a stuffed nose, runny eyes, and an overall feeling of not being well. I brushed the feeling off in the grocery store aisle with the notion that I was near a tremendous amount of the products and of course they were bothering me physically in that environment. Recently I noticed that I felt fairly uncomfortable after opening a bottle of fabric softener in my own laundry room. So, off to the races I went, returning to making my own laundry products. 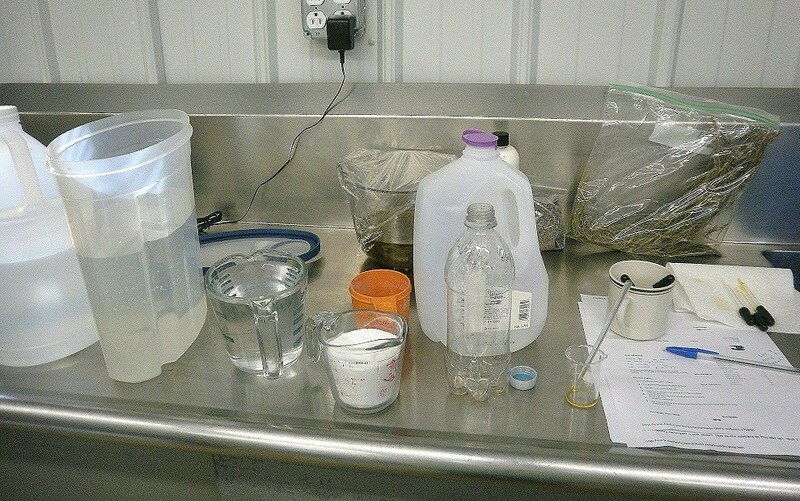 The photo above is from our studio, while working on a fabric softener recipe. I am tweaking that particular recipe. I didn’t like the static cling that followed the test run. Na-da, we have enough of that in the winter! I’ll repost once I am happy with the results. Have on hand a medium to large bucket or container for mixing the soap. Instructions: Grate the soap and put it in a saucepan. Add 6 cups of hot water. Heat using low to medium settings, stirring often, until the soap shavings or slivers dissolve. Add the washing soda and borax, stir until dissolved. Remove from heat. Pour 4 cups of hot water into a bucket. Add the soap mixture to the hot water in the bucket. Stir. Add 1 gallon plus 6 cups of warm water. Stir. Let sit for 24 hours. Pour the liquid soap into bottles (I used 2 empty gallon water jugs). Note: this recipe does not produce a thick gel. The laundry soap that my husband and I made in the past had to be scooped out, similar to a thick gelatin. This particular recipe makes a liquid laundry soap, slightly on the gel side, pourable. A 1/2 cup of this laundry soap per wash load should do a great job (you may need to adjust slightly based on the hardness of your water). Results: softer clothes, no residue, less itching of the skin, and definitely a blessing to those with sensitive olfactory systems (noses and other breathing/smelling mechanisms)! 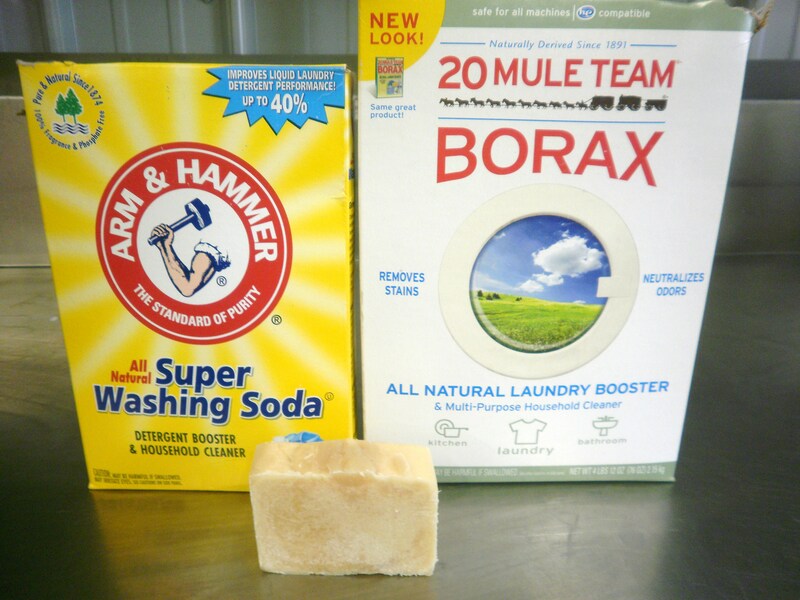 Simple laundry soap is not a science…and it really is inexpensive! I calculated a gallon at a $1.00 or less. I included a photo of what the packaged ingredients look like…and of course, you can get bars of natural soap right here, from Annie’s store! Who else washes their clothes with goat milk? P.S. Ignore the herbs (lemon balm, lavender, and rosemary) on the back of the work table. They are NOT included in the laundry soap!